US Customs and Border Protection officers are snooping through the contents of more travelers' electronic devices than ever, and don't follow protocol 67% of the time, according to a new report by the Department of Homeland Security's internal watchdog. The department's Inspector General found that there were 29,000 devices searched during "secondary" inspections in 2017 out of 397 million travelers, up from 18,400 searches the previous year on 390 million travelers - less than one percent of all people entering the United States. 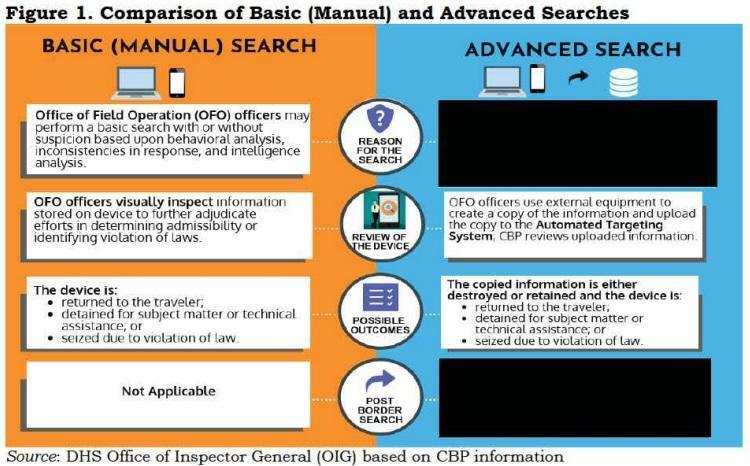 During an enhanced secondary inspection, CBP's Office of Field Operations (OFO) can manually review information on a traveler's electronic devices - or they can connect external equipment to copy information for uploading and analysis in CBP's Automated Targeting System (ATS). Unfortunately for travelers, the OFO was found to have skirted or ignored standard operating procedures during searches of electronic devices, according to the Inspector General report. Without disconnecting from networks before searching them, OFO officers were able to retrieve or access information stored remotely in violation of DHS policy. The DHS IG recommended better documentation for searches, more consistent disabling of data connections prior to searches, and the deletion of data fom thumb drives once it is no longer needed, and for the development of a system to evaluate whether their electronic surveillance techniques are working.